There have been plenty of adjustments while establishing a newfound home within German borders. We seldom understand advertisements, are shooting in the dark when ordering dinner sometimes, and rarely have internet service when the hotspots just aren’t doing the trick. Fear guides many of our decisions. When we don’t handle our fear, it can cripple us. This kind of fear entraps us, we are not able to move in any direction. In these situations, the individual with the fear is hurt by their fear. Unfortunately, sometimes being crippled by fear hurts who or what the fear is directed at more than the person with the fear. One common instance of this today is Islamophobia. Ten of us went out to dinner last night at a popular mediterranean restaurant in Darmstadt. It was decorated well with funky ceiling lights, cozy tables, and complementary bread– obviously a fan favorite. We were engrossed in conversation from the moment we sat down, covered almost every topic, exchanged belly laughs, and enjoyed a delicious meal. I am a creature of habit and rarely venture outside of my bubble. For most of my life I’ve lived in comfortable ignorance of everything going on outside of my own little world, not thinking very hard about things that didn’t effect me directly. If I’m being honest, living this way made me happy. Keeping up with the news is upsetting; something bad is always happening somewhere, and I will be the first to admit that it is way easier to just not pay attention to it. Prior to setting off on this German endeavor to document the refugee resettlement, I received an array of reactions. Most of which consisted of immediate surprise, skepticism, and curiosity. Most people were initially shocked that a young, blonde-haired, blue-eyed, bubbly 22-year-old female was interested in contributing to such a momentous and complex topic – and even more – that I was interested in working with actual refugees. Finding peace after struggle leads one down a unique path. For myself, I faced a year of many personal hardships. Over time, I decided I could no longer continue that way of living. With that conclusion, I had no choice but to let go of them and start anew. Accept that I am human, forgive myself, turn the page, and begin again. In body, we can only be in one place at a time. Our experiences and emotions are all contextualized by whatever particular place we inhabit in the moment. Changing places can change everything. Or nothing. When a country suddenly gains over a million new residents, you’d think it would be easy to tell the newcomers from the locals. In my first few days in Darmstadt (Germany), this didn’t seem to be the case. As we’re encroaching on our first week in Germany, a great deal of time has been spent reflecting on our experiences thus far. Darmstadt is a city full of beauty. Whether it is the different languages dancing around us, fresh pastries available daily for breakfast, market shopping for fresh food, or the excitement of being in a new country. Although, we do face challenges on a day-to-day basis. How are people experiencing refugee resettlement in Germany? We are a small team of Americans spending a month in Darmstadt, Germany. 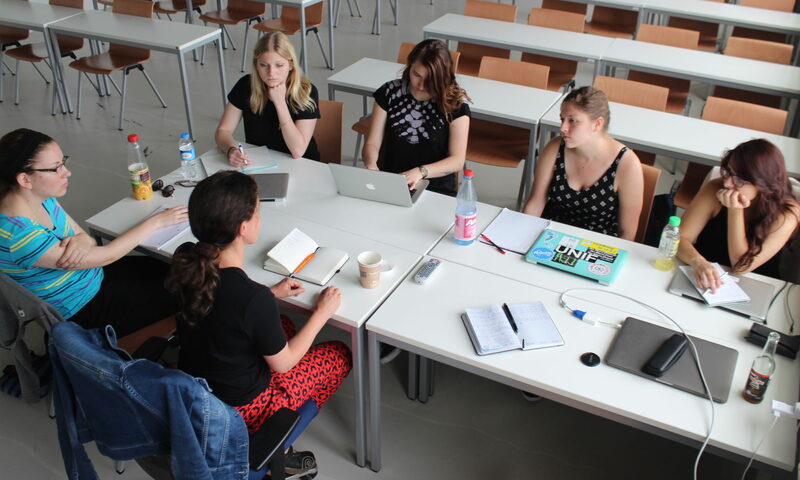 We are being graciously hosted by Hochschule Darmstadt, partnering with valued colleagues in the International Office, Social Work: Migration & Globalization, Online Communication, and Online Journalism. While we are here, we are seeking the humanity of this humanitarian crisis, trying to understand as many perspectives as possible on the ongoing resettlement of refugees throughout Germany and the EU.